Undeniably, this classic is incomparable as it elates the palate with a dynamic dance between sensual and cerebral. 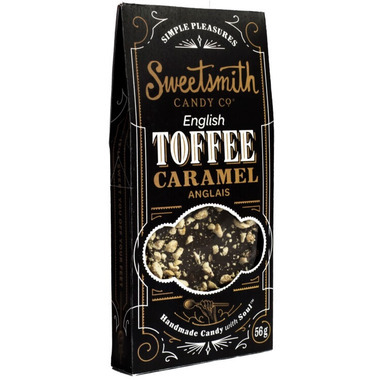 Indulging in this English Toffee begins as your teeth uncover the soft hand coated medium dark Belgian Chocolate, revealing the rich butter toffee base. 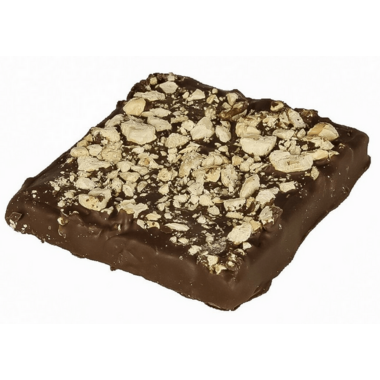 Ingredients: Cane sugar, salted butter, corn glucose, chocolate (contains: sugar, sustainable palm oil or coconut oil, cocoa powder, soy lecithin, vanilla) peanuts, soy lecithin, vanilla. Made in a facility that processes nuts, soy and dairy. I'm rating this a 3 because it's such a small piece. The packaging is hugely wasteful. The product is very good but wouldn't buy it again.